Sure, you might have had plans to study for your exam weeks in advance. But between other assignments, extracurriculars and trying to have a social life, scheduling regular study time can be tough. But now it's the night before your test, you haven't started studying and you expect to see the morning light before you get your nose out of your textbook. It's not ideal, but it happens to the best of us. But what exactly happens to your body when you pull an all-nighter? On top of the obvious sleepiness, sleep deprivation (even for one night) changes your brain on a molecular level in a way that can affect your ability to think clearly. You need to learn about the science of sleep deprivation – and what to do if you're facing a full night of studying. Your body relies on sleep to help your body rest and recover, and that includes your brain. Sleep literally helps "detoxify" your brain: cerebrospinal fluid (CSF) pumps through your brain more quickly while you doze, helping to clear waste from your brain tissues, explains the National Sleep Foundation. Sleep also plays an important role in your memory, helping you store the info you learned – including all that study material! – throughout the day, and also helps you retain important memories for better recall later. On a molecular level, sleep is important for the maintenance of myelin, a substance that surrounds the nerves in your brain. Myelin is a fatty, waxy substance that lines and insulates the axon of each nerve cell – like the rubber that insulates an electrical cord – to help your nerves transmit the electrical signals needed for brain communication. Healthy myelin helps your nerves communicate efficiently, so all your brain's processes, including learning and memory, work properly. What Happens During Sleep Deprivation? While losing an hour or two of sleep here or there might not feel like the end of the world, pulling an all-nighter (or worse, multiple all-nighters within your exam period) can significant affect your memory. One recent study, published in "PLoS One," found that just one all-nighter is enough to significantly change the microstructure of the white matter of your brain (a type of brain tissue essential for cognition), and that the change was caused by disruptions in myelin and nerve cell membranes. Since myelin is so crucial for nerve communication, it makes sense that any changes in your myelin levels affect your cognition, and an all-nighter will change the way you're able to learn and store information. Each hour of sleep you lose reduces your cognitive function, explains sleep expert David Earnest, Ph.D., in an interview with ScienceDaily. And the information you do learn will get stored in your short-term memory. So while your all-nighter might get you through the midterm, you'll need to learn it all over again come finals. Finally, an all-nighter can mess with your natural sleep cycle. Our bodies have a natural daily sleep and wake pattern (dubbed a circadian rhythm) that uses hormone fluctuations to help us wake up in the morning and go to sleep at night. And while you can adjust your sleep cycle to fit your daily schedule – at least to an extent – losing a whole night of sleep throws the cycle out of whack. So if you have exams or assignments in the days following your all-nighter, you might be sabotaging your performance on those as well. So... Is an All Nighter Worth It? In a word: no. The best way to study is in 20- to 30-minute blocks in the days leading up to your exam, advises Earnest, since that will help you learn and recall information most effectively. But, let's be honest: you're probably not pulling an all-nighter unless you need to. In that case, it's better to prioritize the information you study and schedule in some time for sleep, rather than staying up all night trying to learn everything. Science and math often build on concepts you learned previously, so look at the most recent and complex chapters first – attempting those problems will help you identify "holes" in your knowledge that you can go back to study, so you don't waste time studying concepts you're already familiar with. Drink a cup of coffee six to seven hours before bed to temporarily boost your alertness, so you can stay focused during your study sessions. And review the toughest concept shortly before you head off to sleep and again when you wake up to harness both the memory-enhancing effects of sleep and spaced repetition during studying. After your exam, get your sleep cycle back on track ASAP by setting alarms that tell you when to go to sleep and when to wake up. Blackout curtains, reducing screen time in the hour before bed and relaxing stretches can all help you drift off to sleep, so you aren't stuck with the memory-draining effects of sleep deprivation all week. 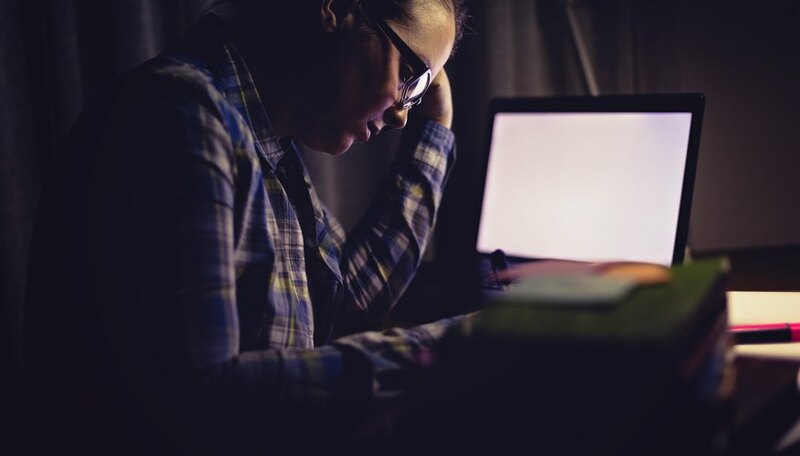 ScienceDaily: Studying: Is It Bad for Your Health to Pull an All-Nighter? National Sleep Foundation: Sleep and the Brain: What Happens? Tremblay,, Sylvie. "Your Brain On: An All-Nighter." Sciencing, https://sciencing.com/your-brain-on-an-all-nighter-13711539.html. 18 May 2018.